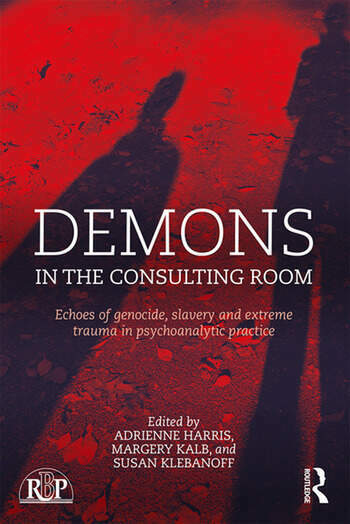 Demons in the Consulting Room: Echoes of Genocide, Slavery and Extreme Trauma in Psychoanalytic Practice isthe second of two volumes addressing the overwhelming, often unmetabolizable feelings related to mourning, both on an individual and mass scale. Authors in this volume explore the potency of ghosts, ghostliness and the darker, often grotesque aspects of these phenomena. While ghosts can be spectral presences that we feel protective of, demons haunt in a particularly virulent way, distorting experience, our sense of reality and our character. Bringing together a collection of clinical and theoretical papers, emons in the Consulting Room, reveals how the most extreme types of trauma can continue to have effects across generations, and how these effects manifest in the consulting room. Essays in this volume consider traumas that have affected multiple generations of people, such as the Holocaust, experiences in the gulags, and the experience of slavery. Authors here consider the clinical challenges of working with the demonic force in severe childhood abuse and the effects of serious and prolonged physical injury and illness. Inevitably, there is in such difficult clinical work, the combined effects of hauntings in the analysts and in patients and often in the surrounding culture. In this book, distinguished psychoanalysts explore the myriad forms of ghosts and the demonic, which interfere and disrupt the endlessly difficult psychic work of mourning. It will be of interest to psychotherapists and psychoanalysts, as well as social workers, family therapists, psychologists, and psychiatrists. emons in the Consulting Room ill appeal to those specializing in bereavement and trauma and, on a broader level, to sociologists and historians interested in understanding means of coping with loss and grief on both an individual and larger scale basis. Introduction. Part I: Clinical. Kalb, Ghosts in the Consulting Room: Reluctant Ancestors. Atlas, The Dybbuk- It’s Me or Him. Fox, Occupation: A Ghost Story. Katz, Repressed Ghosts and Dissociated Vampires in the Enacted Dimension of Psychoanalytic Treatment. McGleughlin, Do We Find or Lose Ourselves in the Negative? Part II: Community & Culture. Kuriloff, The Past is the Presence Between Us: Psychoanalysis and the Spectre of the Shoah. Dimen, Ghostliness and Boundary Violations. Sebek, Basic Uncertainty and Totalitarian Objects. Gump, The Presence of the Past: Transmission of Slavery’s Traumas. Etkind, Wounded Stories. Gerson, Afterword. Adrienne Harris is on the faculty and is a supervisor at the NYU Postdoctoral Program in Psychotherapy and Psychoanalysis. She published Gender as Soft Assembly in 2005. She writes about gender and development, about analytic subjectivity, and about the analysts developing and writing around the period of the First World War. Margery Kalb is a psychologist and psychoanalyst in private practice in New York City. She is on the faculty at the NYU Postdoctoral Program in Psychotherapy and Psychoanalysis. She also teaches and supervises clinical work for the doctoral psychology program at Pace University. Dr. Kalb is the author of several papers on ghosts. Susan Klebanoff is a clinical psychologist and psychoanalyst in private practice in New York City. She is on the faculty of the Stephen Mitchell Center and is an adjunct clinical supervisor at the Ferkauf School of Yeshiva University. Klebanoff has previously co-authored a book on depression for middle school aged children and a chapter in a book on uncertainty in psychoanalysis.